Heartland Theatre Company’s senior performing troupe, Young at Heartland, will perform their fall showcase, offering dramatic and comedic scenes and monologues — maybe even a song or two — at the Normal Public Library on Friday, October 14th. This free event, open to the public, will take place from 2 to 3 pm in the library’s Community Room. And refreshments will be offered. 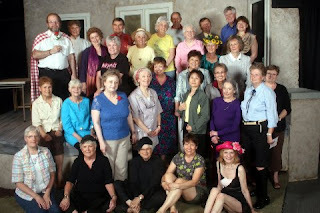 If you are over 55 and you’ve been considering joining Young at Heartland or adding acting and performance skills to your resume, you will want to attend to see how much fun the members of Young at Heartland have and just exactly what they do. I'll be heading over to the library this afternoon to see the show! It's always a delight.